Presenting our ABS-Lock V-ST anchorage point in moving images: Watch our short product video to find out more about its most important features! This stainless steel anchor (M12 thread), which is screwed through a steel structure and countered on the other side, is equipped with an unobtrusive anchorage eyelet. It is designed to protect 1 individual from falling and is suitable for all directions of load (incl. axial). Our standard package also includes 1 counter nut. 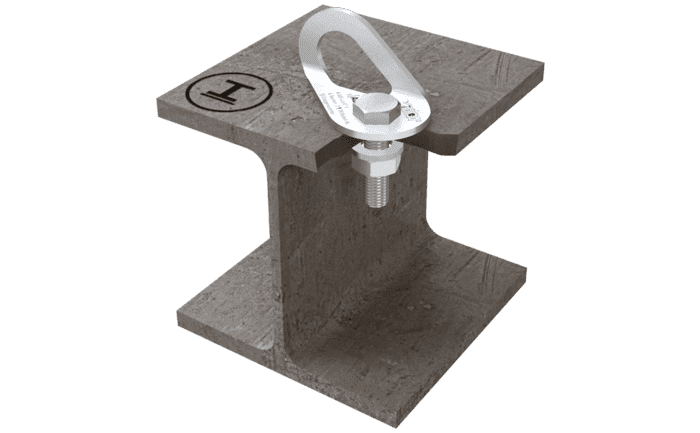 Our ABS-Lock V-ST is either inserted through a load-bearing steel structure and countered on the other side or screwed straight into the subsurface. Its eyelet is designed to provide a safe anchorage point for 1 individual. Protect your workers when they are working near a dangerous edge or high up using this easy-to-use, unobtrusive fall arrest solution. Your fall arrest kit is not complete without matching fall arrest equipment (PPE). Our range of products offers everything you need - from safety harnesses to a selection of connectors and a choice of different self-retracting lifelines (SRL). Whether you are working in an industrial environment, doing window-cleaning work or busy on a roof: We offer a selection of PPE sets which are geared to the needs of these special applications.